Interview with the Firth J Chew Studio from Spokane Civic Theatre. (from left) Max Elinsky, Pam Kingsley, and Jake Schaefer of Spokane Civic Theatre's Firth J Chew Studio. 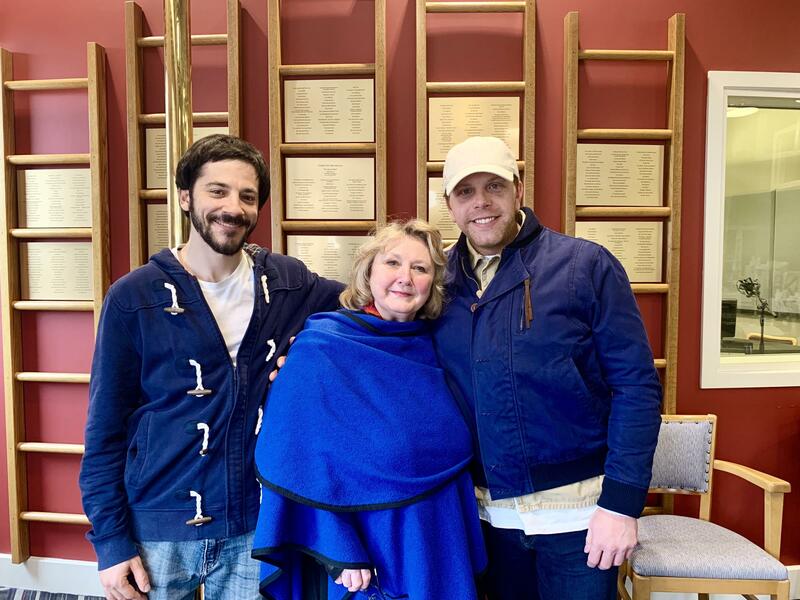 Creative Director Jake Schaefer and Constellations director Pam Kingsley of Spokane Civic Theatre's Firth J Chew Studio arrived for their interview alongside actor and Spokane newcomer Max Elinsky, who holds a starring role in their upcoming production. This 70-minute play begins with a simple encounter between Roland, a beekeeper, and Marianne, a quantum physicist. From there, the audience is taken on a spellbinding, romantic journey that defies the boundaries of the world we think we know and questions the difference between choice and destiny. Performances will be at 7:30 PM Thursday-Saturday and 2 PM Sunday beginning on November 9, with more at the same times each week through December 2. This production is rated PG-13 and may not be suitable for all audiences. Amid their interview this morning, four actors—Julie Berghammer, Jacob Carruthers, Moira Moore and Jerry Uppinghouse—played out two short scenes for us under the direction of Troy Heppner, giving us a tantalizing taste of their spooky new show: “Two Witches, No Waiting.” Set in a small Texas town, it spotlights sisters (and supposed witches) Arlene and Elzbeth Marcus and the quirky characters that surround them as they stew in a heady brew of twists and turns, where barn owls spy on people through windows, closets fly open and even their house itself seems alive. This gray Thursday morning, the KPBX studio was filled with the beautiful singing voices of Mickey Zhang and Emily Buckmaster from Northwest Opera, accompanied by Lois Robertson on piano. The three musicians arrived at the station with Musical Director Tim Campbell and Director Donna Skoog to discuss their latest production: a musical adaptation of “Much Ado About Nothing,” the tale of two intertwined love stories written by William Shakespeare. Performances will be at 7:30 PM on November 2 and 2:00 PM on November 3 & 4 at the Spokane Children's Theatre.